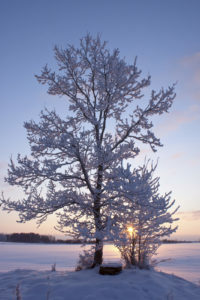 Keep your trees healthy all winter long! Taking care of your trees is important every month of the year, but it’s especially important during the winter months when the weight of snow and ice will be on top of them. Here is what you need to know to care for your trees this winter. Branches that are sitting underneath the weight of snow and ice are much more likely to break and fall in your yard. As a result, you should take a look at the health of your trees and tree branches before winter weather begins. You should prune your trees and check them to look for any damaged or dying parts. Tree trimming is also a necessity to strengthen the branches that are already there to make sure they are getting the nutrients that they need! Rodents are especially active during the winter, when it’s harder to find food and shelter. You should protect the base of all of your trees to make sure that rodents are not stealing the food and nutrients that you intended for your trees! Fencing is an easy way to stop winter rodents from becoming a bigger problem. You should check your existing fencing before the winter to complete any necessary repairs. Finally, you should also work to make sure that your tree doesn’t dry out over the course of the winter. Put a base of mulch around the tree to lock the moisture into the roots. You can also water your tree extra during the winter months when it is warmer out. Make sure that the tree roots take in as much as possible to ensure a strong and healthy tree. This entry was posted on Friday, December 15th, 2017 at 8:31 pm. Both comments and pings are currently closed.